I remember receiving my first telescope back on Christmas Day, 1975. My parents knew I had an interest in the night sky, therefore they purchased a 2.5" refracting beginners telescope from Sears and Roebuck. It was with that telescope I became totally hooked on astronomy. My first glance at the waxing gibbous moon with the high powered eyepiece that came with the telescope introduced me to the moon's cratered surface. From then on, many objects in the universe. Maybe this holiday season you received a new telescope yourself. This is very exciting as you could be on your way to discovering many amazing farthings in the night sky. Although most of them are so far away and faint that just detecting them can be the challenge! Whether your new scope is a long, sleek tube or a compact marvel of computerized wizardry, surely you can't wait to try it out. 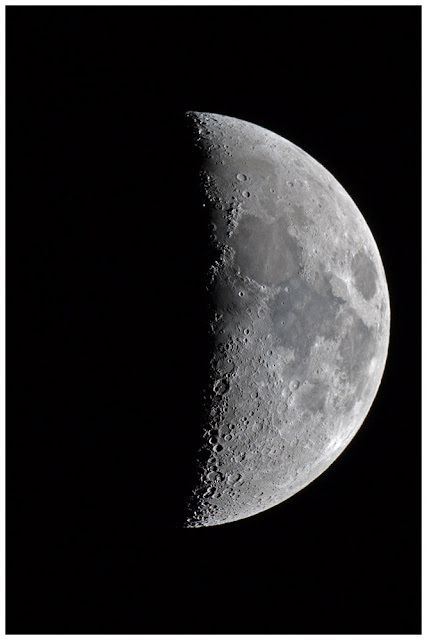 The waxing Moon picture in this post is just before the first-quarter phase, as it appears in an amateur telescope magnified about 40 times. The Moon changes phase from night to night, revealing new features every step of the way. The Moon will next be at this particular phase, with the terminator running almost down the middle, on the evening of January 4, 2017.